The Weiman Automatic Washer is specially formulated for use in washing equipment and for safe manual use. Used for effectively and safely cleaning glass, plastic, rubber and metal surgical instruments and equipment. It leaves instruments moving freely and spot-free. 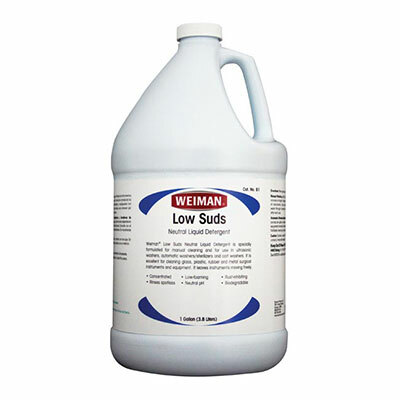 Weiman produces a variety of detergents that are designed for use in ultrasonic washers. You can choose between Weiman’s neutral, enzyme and alkaline formulas depending on the level of soils to be removed. Light to moderate soils can be treated with neutral detergents. Formulas with different combinations of enzymes should be utilized for cases where bioburden includes blood, fats and starches. Alkalines are appropriate for heavier soils where a stronger detergent is needed to lift debris.